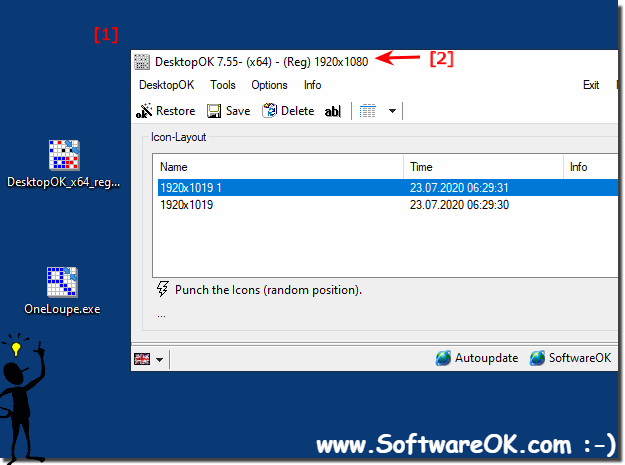 At DesktopOK 1.71 it is possible to save the DesktopOK settings and Desktop Icons Layout in The Windows Registry! Similarly, one can now optionally rename the DesktopOK.exe to DesktopOK_reg.exe. Thus, the Iconlayout and the settings are stored in the registry. Since there were reports by user, about save problems in Windows 7 is available at this time as an alternative. (Image-1) DesktopOK save the settings in Windows Registry! DesktopOK - FAQ-7: Is there a way i can stop it from saving the file to my desktop? How do I stop files automatically going to my documents in windows 7? How to stop adobe files saving to desktop? Stop windows from saving in last folder? How do i stop downloads from saving to my computer? How to stop downloads from saving to the desktop? Desktop ok exe, How do I stop files automatically going to my documents in windows 7? DesktopOK automatic ini start, stop windows from saving in last folder? How do i stop downloads from saving to my computer, how to stop downloads from saving to the desktop? Thank you for your program DesktopOK. I use it all the time. I have a question... everytime I save my desktop it puts a ini file on my desktop. it's called "DesktopOK.ini". Is there a way I can stop it from saving the file to my desktop? Very nice program design. The program seems to save OK but does not restore. I tried the other version but got the same results. Nothing happens when I click restore after changing the layout to test the program. What can I do? My PC has other users than me, sometimes we are logged on at the same time (using Switch User).? Only I run DesktopOK, have it set up to auto-save icon position. I have two monitors, and use both in my account.? Another user comes at the computer, switches to his user account in Windows, DesktopOK keeps running in my account. This other user uses different screen resolution, and only one monitor.? When I switch back to my Windows account, I see that DesktopOK has saved positions with resolution from that other user, and with only one monitor. If I haven't manually saved icon positions before his switch, I cannot restore my icons. ?